The Compatibility Astrology Report is designed to delve into relationship astrology. It goes over synastry, Individual Relating Traits Venus in the signs, houses and soft and hard aspects, Three sections of synastry between two people's charts including Personal Issues, Primary Forces and Generational Values. Synastry Interpretations include soft and hard aspects between the Sun, Moon, Mercury, Venus, Mars, Jupiter, Saturn, Uranus, Neptune, Pluto, Chiron and the North Node. This report describes the unique ties that exist between two people, both the strengths and weaknesses of those ties. This relationship report is approximately 20 pages and fully illustrated. Individual Relating Traits Venus in the signs, houses and soft and hard aspects, with easy-to-read introductions. Three sections of synastry including Personal Issues, Primary Forces and Generational Values. Synastry Interpretations between the Sun, Moon, Mercury, Venus, Mars, Jupiter, Saturn, Uranus, Neptune, Pluto, Chiron and the North Node. is an American singer and actress. Born and raised in Houston, Texas, she performed in various singing and dancing competitions as a child, and rose to fame in the late 1990s as lead singer of R&B girl-group Destiny's Child. Managed by her father Mathew Knowles, the group became one of the world's best-selling girl groups of all time. Shawn Corey Carter (born December 4, 1969), known by his stage name Jay-Z (sometimes stylized as Jay Z, or JAY Z), is an American rapper, record producer, and entrepreneur. He is one of the most financially successful hip-hop artists and entrepreneurs in America. In 2012, Forbes estimated Carter's net worth at nearly $500 million. He is one of the world's best-selling artists of all time, having sold more than 75 million records, while receiving 17 Grammy Awards for his musical work, and numerous additional nominations. This report has been written to introduce you to the concepts of astrology and how to get started in relationship astrology. Astrology is a complex and meaningful science which takes years to study and apply successfully; however, we would like to whet your appetite with this report, and encourage you to deepen your understanding through other means. When the planet Venus is placed in the third house of your birth chart communication is an important component of any relationship. You're bright and optimistic enjoying pleasant interchanges with other people in general, and with your siblings and relatives specifically. Your relationship with your siblings is likely to play a major role in your life. You like to fill your mind with pleasant thoughts rather than dwelling on negative and disturbing ones. Therefore you enjoy social outings in pleasant company, quiet moments with nature, attending the cinema or theatre, or reading an entertaining light novel. The arts such as theatre, opera, music, ballet, sculpture or art probably appeal to your refined mind. You also find joy through traveling, whether it is a short day trip or a longer tour or cruise. You're the type of person who enjoys sightseeing; chatting to fellow travelers and sending postcards home to loved ones. You're a good correspondent, taking great pleasure in writing and receiving love letters, When not traveling you also enjoy your own neighbourhood, and striking up convivial relationships with neighbours, and local shop owners. You'll value a relationship with someone who communicates clearly. You may meet your partner through a neighbourhood group or via your siblings. With Venus in the sign of Libra you enjoy the company of other people and tend to fill your life with people from all walks of life, although you do have a preference for people from the higher echelons of society. Your diary is filled with social occasions ranging from quiet chats with one or two friends, to larger gatherings of your loved ones. You've plenty of loved ones to choose from because human relationships are such a source of pleasure for you. You are kind and courteous and your enjoyment of people is contagious. As a result you're popular with your friends. Listening to other people's stories and offering soothing advice is almost second nature. You're particularly gifted at solving problems, because your first thought is to maintain harmony in relationships and you can always see both sides of a situation. Therefore you're able to bridge the gap between many a warring party. Your primary relationship is also important, and your first preference is for a long-lasting marriage based on fidelity and trust, rather than a series of shorter love affairs. It's important for you to keep the romance and enjoyment alive, otherwise you could feel trapped in an unrewarding relationship. You've a love of fine arts and enjoy sharing this with your friends and loved ones. You need only be wary of spending too much time and energy on your loved ones at the expense of yourself. The planets Neptune and Venus are connected in your chart indicating that you yearn for romance in your primary relationship. Whether you realise it or not, you're seeking an ideal and perfect partner, who may only exist in fairy tales. If you're not careful you'll become disillusioned with the imperfections of relationships and seek solace in a fantasy world. You need to face the realities and imperfections of yourself and your partner as much as possible. This doesn't mean that you need to completely rule out romance and idyllic love. In fact it might help if you're able to escape with your loved one to a romantic setting, away from the demands of everyday life. Coming to terms with the reality of your relationship simply helps you obtain a better understanding of your primary relationship, and helps prevent you becoming disillusioned. In other words taking off the rose-coloured glasses means that you can make a proper assessment of your primary relationship. As a result you'll experience fewer feelings of resentment and disappointment because your partner fails to be perfect, and you won't be in danger of overlooking some major flaws such as drug addiction or deceit. With the right partner you'll enjoy a sense of peace and fulfillment. You may also enjoy artistic or spiritual pursuits together. You're ardent and loving, responding quickly to your partner's need. In turn you benefit from acts of kindness, love and appreciation. The combination of the planets Venus and Pluto in your chart indicate that you enjoy commitment and challenge in your personal relationships. Unlike many other people, you're not afraid to make the necessary changes demanded within close relationships. In fact you prefer change, especially if the alternative is a staid and steady relationship. You like to be consumed with love and passion, and are happiest when with a partner who feels the same way. You can be disappointed when others fail to soar to great emotional heights and plummet the emotional depths by your side. You want intensity, perhaps even a little drama, in your primary relationship. You're fiercely loyal and committed, and expect as much from your partner. Problems can arise when you don't feel a strong bond with your partner, or if a third partner threatens your relationship. You're a jealous person, and quite capable of seeking revenge when wronged. You need to be careful to choose the right person as your primary partner - someone who reciprocates your love and passion. Otherwise you can waste a lot of time and energy trying to make a doomed relationship work. You may also benefit from directing some of your energy into an all-consuming project, such as fighting for human rights or an intensely creative pursuit. Your North Node is in the seventh house and your South Node is in the first house of your birth chart indicating that you are destined to learn as much as you possibly can about relationships. You benefit greatly through your relationship experiences, both personal and distant associations. You may also experience a sense that many unions formed in your life are pre-ordained. You fare best when you learn to let go of ego-centred actions and become more focused on service to other people. You also benefit from choosing your marriage partner wisely, taking your time to consider the union. With Venus in the sign of Scorpio you're ardent and passionate in your primary relationship, and insist that your partner returns the intensity of your emotions. You're likely to enjoy the heights of passion if your love is matched in its intensity, finding yourself thrust into a world of almost painful pleasure. Sensual pleasure is important to you, although you also like to discover your partner's innermost thoughts and feelings. Problems can occur when your love isn't returned, or if your partner can't keep the intense fires of passion burning. Then you're likely to suffer the depths of despair, perhaps even resorting to manipulation in order to keep your partner's attention. Secret liaisons could play a part in your relationships, either your own or your partner's, particularly if the intensity becomes too claustrophobic. Jealousy and thoughts of vengeance can be a problem, although you would be wise not to give in to follow these avenues. Your challenge is to use your resources to find a middle path between the highs and lows of intense emotions within relationships. Your relationships can then flourish as important resources in your life. At some stage in your life you may benefit financially or through a legacy from an important relationship. This is an ideal combination for a personal relationship in which two people enjoy ease of communication. Jay-Z and Beyonce enjoy each other's company because they are able to communicate comfortably. They enjoy discussions and are not concerned about arguments. Many personal relationships fail simply because two people are unable to communicate both their thoughts and feelings. 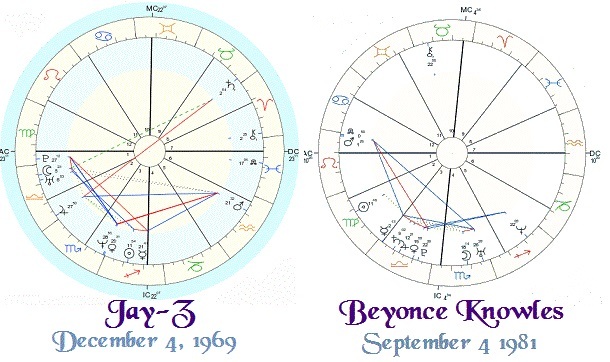 The synastry of these two planets means that Jay-Z and Beyonce are able to tell each other not only what they are thinking, but also how they are feeling. They are able to do so in a manner that is not threatening or hurtful to each other. Therefore Jay-Z and Beyonce are both safe in the knowledge that they are not going to overreact, trampling on each other's feelings. Likewise Jay-Z and Beyonce are easily able to acknowledge the value of the each other's thoughts and feelings. At times Jay-Z and Beyonce may even feel they are telepathic together, seemingly not needing words to communicate but understanding each other's unspoken thoughts. Together Jay-Z and Beyonce are able to take a balanced approach combining passion and reason. They have an understanding and rapport that enables them to clarify their own thoughts and feelings. Jay-Z is likely to be the more intuitive of the two, while Beyonce is likely to rely more on the intellect when communicating. In astrology Mars is the planet of drive and determination whereas the Moon is the planet of feelings. When these two planets form certain patterns the combination can be volatile. 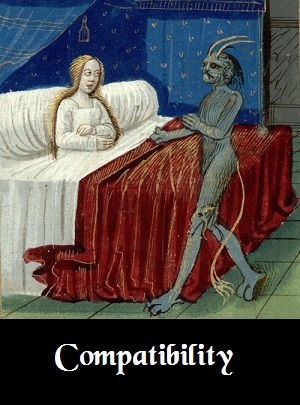 In this case there is a lot of friction in the relationship. Beyonce is likely to feel overpowered by Jay-Z. Beyonce often wonders why she is so easily upset by Jay-Z. No matter how hard she tries to calm her emotions Jay-Z just seems to trigger heated feelings. Beyonce feels a strong attraction to Jay-Z, but she is also aware that this is a troubled association. It is likely that Beyonce believes that Jay-Z lacks sensitivity to her feelings. Jay-Z also senses the friction, but is perhaps not so bothered by it. Jay-Z is more concerned because at times Beyonce seems like a wet blanket. Jay-Z s patience is tested because he feels that he has to console Beyonces feelings before he can achieve his goals in life. Jay-Z also feels a certain excitement in this association, but is aware that the tension can be an obstacle to fulfilment. If both Beyonce and Jay-Z are aware of the problems and face them with honesty then an understanding can be reached and a rewarding relationship result. When this occurs both Beyonce and Jay-Z begin to feel that their lives have become more effervescent with the advent of this relationship. This combination is most difficult for a deeply personal relationship such as marriage or a close personal friendship. It can be advantageous for a working relationship that requires a lot of hard work and energy. For instance, building a house together may be a good way of using the energy of this combination. It is significant in relationship astrology when one person's planet makes contact with the Ascendant in another person's chart. In this case Beyonces Sun is combining with JayZs Ascendant indicating that this is a significant personal relationship. Beyonce and Jay-Z feel strongly drawn to each other, experiencing a sense of completeness in each other's company. Beyonce can really shine through her association with Jay-Z. She appreciates the benefits that this union brings into her life and the way in which Jay-Z helps her achieve her personal goals. In turn Jay-Z has a greater sense of well-being through his association with Beyonce. He welcomes the sunnier aspects of Beyonces personality and appreciates their mutual respect and affection. While this combination is most likely to indicate an intimate love union, it can also augur well for friendships, family relationship and work associations. 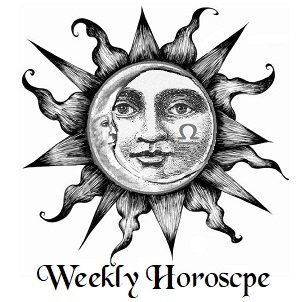 Any connection between two personal planets is considered auspicious in relationship astrology; however, difficult aspects can present a challenge. In this case the couple's Suns are making a difficult connection. On the one hand it is a positive sign that their Suns are connected. On the other hand Beyonce and Jay-Z are presented with the challenge of overcoming some problems before experiencing the full rewards of this union. This is true whether they are forming a love relationship, friendship, family connection or working association. The major problem is one of rivalry. Beyonce and Jay-Z experienced the instant attraction that comes with meeting someone different. They are poles apart in the way that they view the world. At first this seemed exciting, enticing and romantic. As times moves on, and the initial excitement wears off, they are presented with the obstacle of communicating with someone who views the world in a different manner. They are at cross-purposes and may resort to competing with each other, rather than co-operating. This can be frustrating, causing both Beyonce and Jay-Z to sometimes feel as though they are 'hitting their heads against a brick wall,' as the saying goes. As long as there are other positive aspects in this relationship, both Beyonce and Jay-Z are likely to overcome the obstacles and create a harmonious and loving relationship. However, they will both have to learn to 'walk a mile in someone else's moccasins'. The combination of the personal planets of Mercury and Venus is a desirable one for an intimate union, and certainly advantageous to any association which requires harmony and collaboration. Jay-Z and Beyonce enjoy each other's company, finding it easy to co-operate and share their experiences. They are compatible. Conversation has an easy flow and pastimes are fun, free of the restraints that sometimes hamper clear communication. Jay-Z and Beyonce share an appreciation of the arts, perhaps even partaking in a joint creative or artistic activity. Discussions are harmonious because Jay-Z and Beyonce are so often in agreement, including money. They concur on how money is saved and spent and enjoyed. Jay-Z and Beyonce value the intellectual stimulation provided by each other. Jay-Z, in particular, experiences mental inspiration from his association with Beyonce. Perhaps Beyonce is JayZs muse in some form of the arts. Jay-Z gains confidence in his opinions and ideas as a result of his relationship with Beyonce. In return Beyonce appreciates Jay-Zs intellect. Beyonce feels able to relax within this relationship knowing that Jay-Z encourages rather than criticises her. This is a positive combination for any relationship enabling Jay-Z and Beyonce to overcome any obstacles in life and embrace the happiness of the present moment. Jay-Z and Beyonce enjoy each other's company and feel a certain zest for life when together. They share a need for fun-filled adventures and the capability of achieving their goals. Jay-Z and Beyonce feel that the world is their oyster that is ready to explore together. This can include holidays in far-away places, adventure travel and also encompasses any activity that expands their minds and views of life. This is a meeting of higher-minds. Jay-Z feels that Beyonce expands his horizons. Jay-Z feels safe and appreciated in this relationship. Beyonce knows that Jay-Z is a comrade in arms when it comes to fun and adventure. Beyonce feels that she is truly appreciated for her generosity and optimism. Together Jay-Z and Beyonce can conquer the world. Nothing seems too far-fetched. This combination augurs well for a long lasting and happy relationship. A connection between the planet Saturn and the Moon is important. Saturn is the planet of commitment and stability and is often found in relationships that are long lasting. In other words a serious planet such as Saturn is needed for a serious, meaningful union. Jay-Z and Beyonce are satisfied with the relationship and are willing to persist through troubled times realising that the rewards are great. A satisfying long-term relationship results from their patience and persistence. Together Jay-Z and Beyonce are somewhat reserved, perhaps even withdrawing a little from society to enjoy the benefits of their relationship. They are aware that their relationship is one of the most important building blocks in their lives. There is maturity in this relationship. Perhaps Jay-Z and Beyonce have formed this relationship later in life when they can truly appreciate each other and the life that they are building together. Jay-Z feels that Beyonce is offering security and maturity, enabling him to mature in his emotional and home life. Beyonce grows in self-esteem through this relationship, believing that Jay-Z respects her integrity. On the whole this is a positive combination for an enduring, long-term relationship such as marriage. 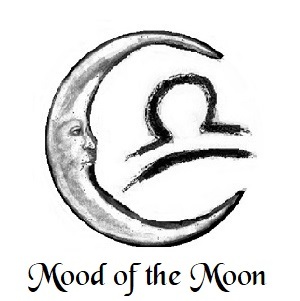 Both the Moon and the Nodes individually are significant in relationship astrology. The combination of the Moon and the Nodes indicates that this is an important personal relationship, one that changes the course of Beyonces life and deeply affects Jay-Z. Beyonce and Jay-Z feel strongly drawn to each other, perhaps experiencing a sense that their relationship was written in the stars. In other words they may feel as though they were destined to meet and form a union. Whether the path of this relationship is smooth or rough, Beyonce and JayZs paths were meant to cross. The nature of this association depends largely on other aspects of Beyonce and JayZs charts. Passion may ignite if the right ingredients are involved, or friendship may be most appropriate choice of relationship. The Sun and the favourable planet Jupiter are combining suggesting that this relationship is blessed with good fortune and happiness. It is an ideal combination for an intimate relationship such as marriage because it indicates shared philosophies on life and the ability to grow together. Together Jay-Z and Beyonce land on their feet no matter how difficult a situation. They seem destined to be in the right place at the right time. Jay-Z and Beyonce enjoy each other's company, feeling all of the benefits that come with this union. Their optimism and enthusiasm are infectious, and as a couple they are popular. In particular Jay-Z shines as a result of his association with Beyonce. Jay-Z feels able to embrace life and all it has to offer. He is aware that his union with Beyonce is truly blessed and that it helps him to achieve his full potential. Beyonce knows that her horizons are continually expanding through her association with Jay-Z. Beyonce feels able to conquer the world. In fact it is likely that both Jay-Z and Beyonce enjoy travelling, studying or teaching together. They enjoy sharing anything that expands their minds and contributes positively to their lives. 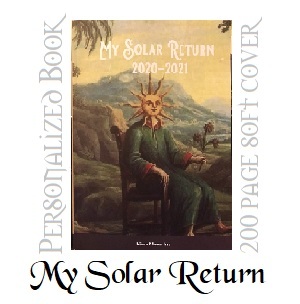 Many astrologers believe that a connection between the serious planet Saturn and a personal planet such as the Sun is important, providing the cement for a long-lasting relationship. In other words a serious planet is needed for a serious, meaningful union such as marriage. It is certainly true that the combination of the Sun and Saturn is found in many, meaningful relationships. However, the harmful planet Saturn can also cause problems. 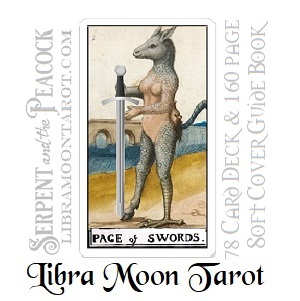 The extent of the problems varies according to the astrological aspect. Certainly this combination indicates that Jay-Z and Beyonce both view this as a serious association, whether it is a marriage, friendship or a working partnership. 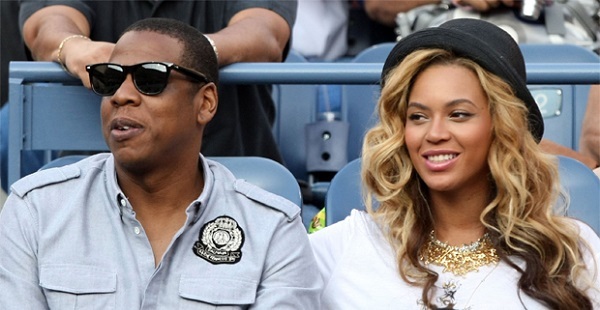 Both Jay-Z and Beyonce are committed to their association. It is likely that they experienced a strong attraction in the initial stages of their relationship, and it is likely to be long lasting. When Jay-Z and Beyonce first meet they each know they have discovered a potential serious relationship, one to which they can commit and build on over a lifetime. If they believe in reincarnation, then it is likely that they feel a karmic attraction, a moment of recognition when they first look into the other person's eyes. However, the very qualities, which they seriously considered as attractive in the initial stages of the relationship, can become the source of friction if they are not careful. In particular, Beyonce needs to be wary of becoming too critical and judgmental. Initially Beyonce found JayZs personality traits to be worthy of a committed union. She admired JayZs qualities as complementing her own. However, it is easy for Beyonce to forget this attraction. As the relationship develops she feels threatened by the force of JayZs personality and takes a superior attitude in defence. As a result Jay-Z feels threatened, disliking the authoritarian side of Beyonce. If Jay-Z is not careful his self-confidence is whittled away and the relationship becomes onerous. It is vital that both Jay-Z and Beyonce work at developing a stable basis for communication and understanding in this relationship. If both Jay-Z and Beyonce work at maintaining their own self-confidence as well as mutual respect then they have the makings for a very successful marriage or working relationship. If this is the case they both benefit from the stability offered by this union, growing in integrity in their own lives. Destiny plays a strong role in Beyonce and JayZs relationship. There is an instant attraction, a spark that ignites the feelings of both Beyonce and Jay-Z. However, fate can be a cruel mistress. This relationship is fraught with problems that Beyonce and Jay-Z find difficult to understand and solve. In particular Jay-Z feels that her light is hidden under bushel. He struggles to express his true self. Perhaps Jay-Z owes Beyonce a favour that seems never to be full repaid or may Jay-Z has an inexplicable sense of responsibility for Beyonce. Whatever the scenario both Beyonce and Jay-Z face certain challenges before reaching a full understanding of this union. This is an exciting and unpredictable relationship. Beyonce and Jay-Z enjoy a lively union, whether it be a romance, friendship or work association. They take pleasure in topical conversations, sparking new ideas and ways of thinking. They may also enjoy taking part in an unusual activity or pursuing an environmental, humanitarian or political cause. This combination of planets indicates intellectual, rather than emotional, stimulation. Consequently this combination may indicate a friendship or work association, rather than a more personal union. However, an intimate relationship with other aspects is enhanced by this combination if both partners enjoy freedom. Beyonce and Jay-Z are excited by each other's minds. In particular Beyonce realises that Jay-Z sparks her creativity. Both Beyonce and Jay-Z enjoy a new-found sense of freedom in each other's company. This is an inspirational relationship whether it be a romance, friendship or a creative working partnership. Both Jay-Z and Beyonce feel excited by this union. Their imaginations are enlivened. In particular JayZs ideas are encouraged by Beyonces creative input, enabling him to better express himself. It's possible that they work together on a creative project. Communication has an easy flow, more intuitive than concrete. Jay-Z and Beyonce establish an empathetic bond which enables them both to exchange their thoughts and feelings with ease. If involved in a romantic liaison then Jay-Z and Beyonce are likely to feel very much in love, viewing their union through rose-coloured glasses. Whatever the nature of the relationship, it is likely that Jay-Z and Beyonce share an interest in the arts, a spiritual path or a philanthropic activity. An intense relationship is the result of this combination of the planets Mercury and Pluto, with communication playing a key role. Consequently it is vital that both Beyonce and Jay-Z communicate honestly, keeping all emotions and thoughts out in the open. This helps them to keep the relationship dynamic rather than volcanic. If Beyonce and Jay-Z enjoy penetrating discussions and passionate pastimes then all is well. If they don't then their union could become overwhelming, particularly for Beyonce. Together they experience a change of perception which is ultimately rewarding, although initially could be disruptive. Notably Jay-Z challenges Beyonces way of viewing the world. This can be an excellent combination for personal and spiritual growth. Consequently it is an ideal combination for a therapist and client relationship. It can also be beneficial for an intimate relationship or friendship, if both partners enjoy intensity, and a demanding working association. This is a difficult combination of the planet Mercury and the asteroid Chiron. Beyonce and Jay-Z have difficulty communicating in a manner that is rewarding. Instead they seem to hurt each other's feelings through saying the wrong thing. In particular Jay-Z seems to upset Beyonce. The problem is that old hurtful memories surface in this relationship. Beyonce and Jay-Z have subconsciously attracted each other in order to learn valuable life lessons, but the journey is not smooth. Beyonce is particularly sensitive to the words used by Jay-Z, and has difficulty listening with emotional calm. Beyonce may accuse Jay-Z of being insensitive and uncaring; however, Jay-Z feels wrongfully accused. He genuinely struggles to find a better way of communicating what he means. These misunderstandings could lead to a breakdown in the relationship, or they could finally result in a better understanding of themselves and each other. Either way compassion is a key ingredient to successfully overcoming past hurts and developing loving communication. This is an ideal combination for a rewarding relationship, particularly a love union or close personal bond. Both Beyonce and Jay-Z feel at ease in each other's company, sharing a common sense of adventure and joy. The old hit song "You Light Up My Life" could be a good theme song for this relationship. Together Beyonce and Jay-Z enjoy good fortune, exploring the realms of higher learning, culture, religion or metaphysics. They may delight in traveling to foreign lands, meeting new people and discovering different ways of life. Alternatively they may take delight in joining a study group closer to home. Either way their horizons are expanded by this union and the attraction is strong. Beyonce is enchanted by JayZs wisdom, experiencing a sense of being led into new and exciting territory. She loves the way that Jay-Z contributes a sense of joy and fulfillment to her life. In return Jay-Z enjoys the fact that Beyonce is always willing to support his ventures. This combination of planets indicates an instant and vital magnetism. It is the type of attraction in which Jay-Z and Beyonce take one look at each other across a crowded room and feel the sparks. Romance is alight and the relationship develops at a rapid rate. Friends are amazed as the couple's union becomes more and more intense. In the short term this relationship provides fun, excitement and stimulation for both Jay-Z and Beyonce. The long-term scenario depends on other aspects of their relationship and the ability of both Jay-Z and Beyonce to respect each other's need for autonomy. It is all too easy for the initial flame to burn out of control. For this reason this combination of planets can be more prominent in relationships that contain the intrigue of a love affair, rather than the stability of a long-term union. Jay-Z feels particularly struck by Cupid's arrow, ignited by the very presence of Beyonce. He wants his love to be strong enough to keep the spark of excitement in the relationship. However, Beyonce is hard to pin down and is likely to become bored once the initial excitement starts to fade unless she is given plenty of room to be independent. It may be difficult for Beyonce to make a commitment to this relationship unless she is given the freedom to inspire Jay-Z without feeling tied down to promises. A strong bond can be achieved if Jay-Z and Beyonce can find the right balance between intimacy and personal freedom. If this is achieved then they can both enjoy a long-term relationship full of joy and romance. This is the combination for lovers. 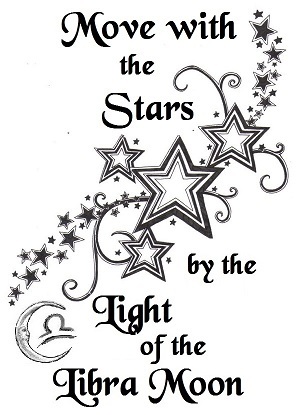 The North Node and Venus are both highly significant in relationship astrology indicating that this association was written in the stars. It is also likely that Jay-Z and Beyonce are in love, desiring to form a close and romantic bond, rather than remain friends only. Passion, romantic love and an intense desire to relate are central to this relationship. Within moments of meeting Jay-Z and Beyonce feel they have known each other for years. They enjoy each other's company, discovering pleasures in common. If circumstances dictate that their relationship can only be a friendship, they would be wise to tread very carefully. This is not an association to take lightly. It could easily take over Jay-Z or Beyonces lives. In some circumstances this combination of Venus and the North Node can indicate an association formed for artistic or creative projects. The glue that holds Beyonce and Jay-Z together is a focus on a joint artistic, spiritual or philanthropic cause, a shared idyll of how to make the world a better place. Together they share many dreams of how to improve their lives, their environment and the world at large. They are a creative duo, never short of ideas and with the ability to inspire. Depending on other aspects of their personalities they may or may not have the stability and endurance to create something concrete. Beyonce is likely to be the leader, the person with the drive which enables them to achieve these dreams. Jay-Z is the creative ideas person who inspires Beyonce. If Beyonce and Jay-Z fail to share a common dream, then this relationship is likely to lack direction and Beyonce and Jay-Z slowly drift apart. They have difficulty maintaining a momentum necessary for a long-term bond. For this reason this combination of planets may indicate a relationship based on a shared project or past-time rather than an intimate lovers' bond. For instance Beyonce and Jay-Z may share a friendship, enjoying martial arts as a shared activity. This combination of the stormy planets Mars and Pluto indicates a passionate and compelling union. The atmosphere is explosive when Jay-Z and Beyonce get together. Sexual energy seems to simmer barely under control. Both Jay-Z and Beyonce need to be wary of letting the force of their heated emotions build up. They need a positive outlet for all of their pent-up energy whether this be a challenging home renovation project or a regular work-out at the gym. Together Jay-Z and Beyonce feel able to conquer the world and are certainly a power to be reckoned with. The initial stages of the relationship are fraught with sexual tension, but the union may not be an intimate one. Rather it may be a partnership committed to hard work and a challenging project. Either way as the relationship develops, the strong and creative force of both Jay-Z and Beyonce takes over and can be directed into a mutually satisfying project. In other words Jay-Z and Beyonce can be passionate about each other or they can direct their passion into an external activity. Either way this is a dynamic and explosive relationship. A common goal is needed in order the make the best of this combination of the planet Mars and Chiron. If Beyonce and Jay-Z share the same drive and ambition then they can successfully overcome past failures and progress in their lives together. Together they bring an element of play and laughter into areas of their lives that were previously weighed down with pain and angst. Together their activities take on a new glow. They may share an interest in the healing arts or in teaching. Jay-Z sometimes feels hurt that Beyonce does not offer the energy and drive needed to support his ventures. As the relationship develops more support may be offered. Beyonce appreciates JayZs insights and wisdom, which enable her to better achieve her goals. Beyonce and Jay-Z have difficulty maintaining equilibrium in this relationship. They both eagerly approach joint tasks. There is no lack of enthusiasm, only a lack of harmony. Problems arise at the start of any joint project because Beyonce and Jay-Z fail to agree on common goals. Once they have managed to agree on the goals, then they both have their own ideas about what is the best process of achieving those goals. They often seem to be heading in opposite directions. In fact they put their own independent desires first, rather than considering what is best for the bigger picture. Beyonce has a tendency to force Jay-Z to do things her way. At times Beyonce can be quite aggressive in her communication. Jay-Z believes that he knows best. The result is tension and arguments. The challenge is for both Beyonce and Jay-Z to learn to co-operate, each using their own talents while respecting the skills of the other person. This combination of the planets Mars and Saturn suggests a strong commitment in which Beyonce and Jay-Z initially struggle to understand each other. On the one hand both Beyonce and Jay-Z are committed to making this partnership work. On the other hand they face almost insurmountable difficulties along the way. Ancient astrologers consider the planets Mars and Saturn to have a harmful effect on humanity. Therefore this relationship needs to be treated with respect, to avoid causing emotional or physical damage to either Beyonce or Jay-Z. The trouble is that they are both determined to force their own egos on to each other, and can be quite brutal in their efforts to get the other person to do as they wish. They need to develop understanding and respect for each other, if it does not already exist. Sometimes Jay-Z tries to force his methods on to Beyonce, only to meet Beyonces stubborn refusal to budge on certain matters. The challenge is a big one in this union. Both Beyonce and Jay-Z need to carefully consider the future of this relationship, knowing that only mutual respect and caring communication can shine a light on their difficulties. Sexual attraction plays a key role in this relationship. Jay-Z and Beyonce find each other's company exciting both in and out of the bedroom. When Jay-Z and Beyonce first meet they experience a thrill. However, it is difficult for Jay-Z and Beyonce to maintain the excitement beyond the initial stages of the relationship. An initially challenging union quickly becomes frustrating as both Jay-Z and Beyonce try to balance intimacy and independence. Jay-Z is irritated by Beyonces constant need for autonomy and her apparent lack of commitment. At first Jay-Z finds Beyonces independent spirit thrilling and arousing, but he soon becomes threatened and annoyed. Beyonce grows to dislike JayZs drive and determination, which she perceives as aggressive and arrogant. The challenge for Jay-Z and Beyonce is to allow each other the freedom to follow their individual interests. These moments of separation may help alleviate the growing tension and re-ignite the positive sparks. This is a difficult and painful combination of the planet Mars and Chiron. Jay-Z and Beyonce have difficulty overcoming past hurts and failures in their relationships. As a result their unresolved problems have an impact on this union. In particular Beyonces insecurities have a profound effect on this liaison. Beyonce is sensitive because of bad experiences in previous relationships. This causes problems in this association, because unwittingly Beyonce reacts pessimistically to certain aspects of JayZs behaviour. Unless Jay-Z always behaves in an understanding and compassionate manner, Beyonce takes offence. This is because Beyonce is predisposed to view JayZs actions in a negative light. It is possible that Jay-Z lacks sympathy to Beyonces problems, but not necessarily so. The onus is on both Jay-Z and Beyonce to become aware of the problems so that they can heal these problems from the past and progress in a more joyful manner in their relationship. Spiritual and philosophical interests could be at the centre of this relationship. Beyonce and Jay-Z enjoy a meeting the meeting of two minds. They are excited by each other's innovative ideas, perhaps sharing a common creative project. Their relationship follows an erratic course, but they are both happy with the stimulation and excitement. They enjoy a non-orthodox association, spurning a more traditional one. A wide range of subjects crop up in conversations including philosophy, science, religion, metaphysics, technology, world cultures, environmental science and world politics, to name a few. Beyonce and Jay-Z spend much of their time together pursuing their common interests and learning from each other. Beyonce experiences a broadening of her intellectual concepts through her association with Jay-Z. She delights in the challenges that this ever-changing relationship provides. Jay-Z is excited by Beyonces keen interest in his ideas. He appreciates the freedom of expression and exchange of ideas. This is an intellectual connection and therefore is more likely to benefit a friendship rather than a lover's union. Jay-Z and Beyonce are rejuvenated through their relationship. Life takes on a new glow from their first moment of meeting. In each other Jay-Z and Beyonce have found a soul-mate, someone who understands them at a very deep, metaphysical level. As the relationship develops both Jay-Z and Beyonce are challenged to reach deep within themselves in order to change and grow. Depending on their individual traits they can either enjoy this process of change or they can resist. Either way they are being dared to view their lives in a different and broader manner. Jay-Z and Beyonce encourage each other in this growth process through co-operation and understanding. Together they feel able to overcome all obstacles. As a result it is likely that, through this union, both Jay-Z and Beyonce begin to lead more creative lives. On the whole this is a joyful union. Jay-Z and Beyonce enjoy each other's company, both benefiting from the joy that is destined to enter their lives through this liaison. It is possible that Jay-Z and Beyonce meet while traveling, at a place of higher learning, in a sports arena or through a philosophical or religious organisation. Together they enjoy exploring any or all of these avenues of joint interests. However, both Jay-Z and Beyonce need to set sensible limits on this union and any project undertaken together. Otherwise they may go overboard in their enthusiasm, egging each other on and taking unnecessary risks. This combination of the planets Uranus and Neptune does not necessarily indicate a personal relationship, but rather an impersonal type of association. Either way, it is likely that life can be approached in a new and imaginative fashion for Beyonce and Jay-Z as a result of this union. Together they stimulate growth and change in each other. Beyonce is particularly interested in keeping this association fresh and alive. She finds JayZs ideas and opinions intellectually stimulating, prompting her own creative ideas and shared activities. JayZs imagination is more to the fore in this relationship. He is able to express a more intuitive side of himself. Together Beyonce and Jay-Z share insights and this encourages their ingenuity. Personal growth is one theme in this relationship. Both Jay-Z and Beyonce embrace change. Together they are willing to live life to the fullest, breaking free of habits or anything that hinders their progress in life. Jay-Z and Beyonce may be at the centre of organisations involved with spiritual matters, personal growth, medicine and medical breakthroughs. There may be a strong sense of destiny attached to this union. Jay-Z provides the impetus for change, preferring to challenge Beyonces previously held beliefs and patterns of behaviour. In turn Beyonce is able to respond to Jay-Z in a way that enables him to achieve his goals. This is a rewarding relationship as long as each person enjoys stimulation and transformation.